Starting September, the Keizerskapel in Antwerp and The Phoebus Foundation will join forces and create a series of exhibitions where some remarkable artworks will be on display. 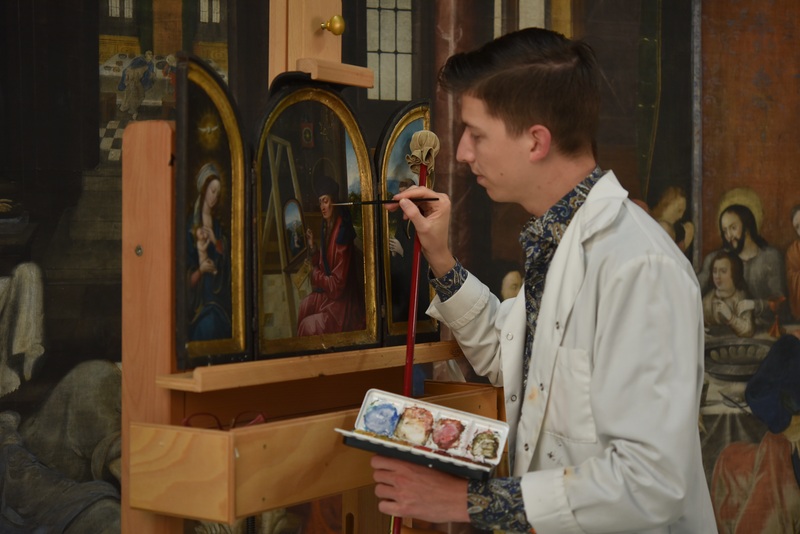 The first exposition will focus on the newly restored triptych, Saint Luke painting the Virgin. This fine example of Antwerp panel painting from the beginning of the 16th century has been in private ownership for centuries. Saint Luke painting the Virgin is a beloved subject among the artists of the fifteenth and sixteenth century. Painters like Rogier Van der Weyden, Hugo Van der Goes and Jan Gossaert all depicted the Madonna being drawn by the evangelist Saint Luke. The popular theme was used for the large altarpieces of the painter’s guild (the Guild of Saint Luke). They are propagandist images, heavenly legitimations of the painter’s profession, approved by the Holy Virgin and Christ himself. However, the Antwerp triptych is different. It separates itself from his predecessors in size and meaning. The dimensions of the work confirm that the painting was used in a context of private devotion. The side panels indicate that the work could easily be closed and moved. 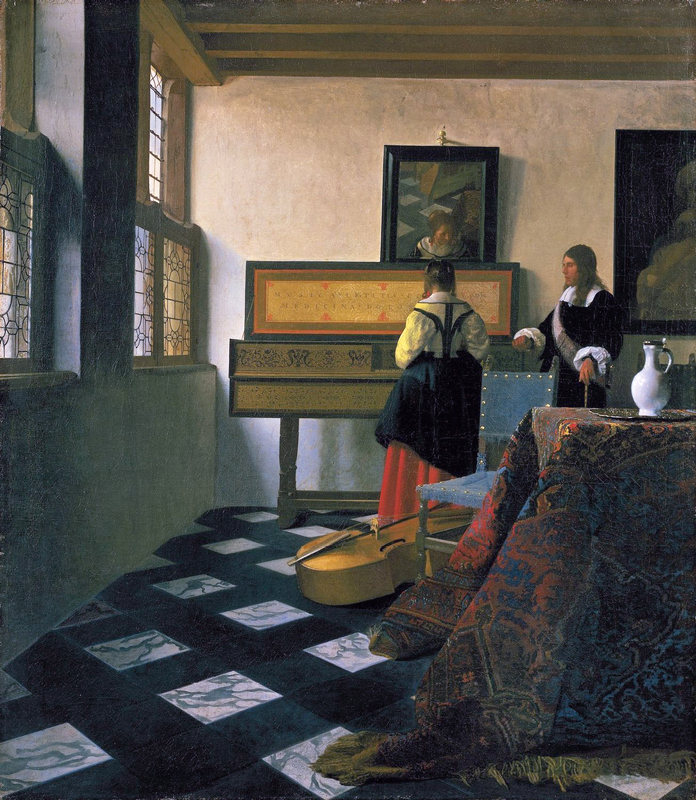 Furthermore, the painting distinguishes itself from all other works with the same theme by the presence of a donor portrait, a Benedictine monk, on the right. This triptych carries a powerful spiritual meaning with it. A most divine scene unfolds itself to the viewer, the legendary creation of the first image (icon) of the Virgin and Child. It is a justification of a complex theological discussion: ‘Why should pictures be permitted in Christianity?’. At a moment in history where image making is fiercely debated, this anonymous painter (and with quite possibly with the advice of the donor) chose to take a stand by creating a strong visual message. 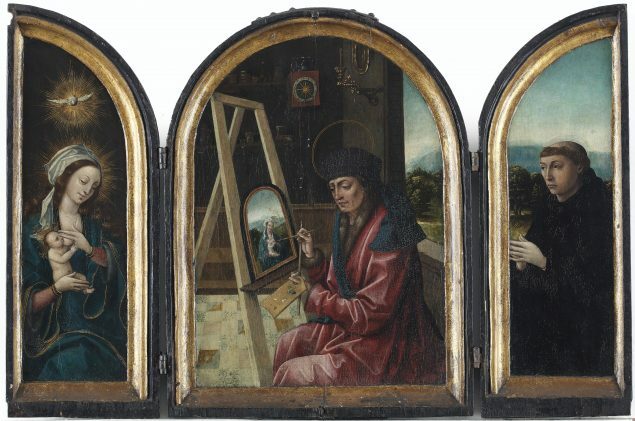 Until the end of the year you can discover the hidden layers of this fascinating triptych and find out how the recent restoration revealed new findings. The exhibition is curated by Niels Schalley from The Phoebus Foundation.